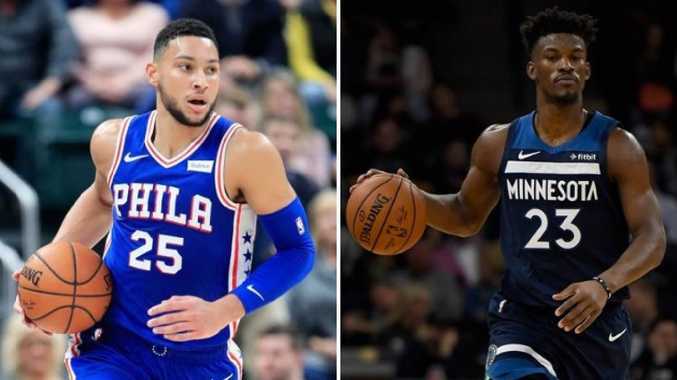 Philadelphia 76ers' Aussie young gun Ben Simmons has a new star teammate in former Minnesota Timberwolves wing Jimmy Butler. AUSSIE young gun Ben Simmons is getting another All-Star to help his Philadelphia 76ers launch a serious strike on the NBA championship. Las Vegas oddsmakers immediately halved the 76ers' odds to win the NBA title from $20 to $10 and claim the Eastern Conference from $8 to $3. The deal is yet to be formally announced by the NBA, but both teams have agreed to it. The 76ers have had an inconsistent start to the new NBA season winning eight and losing five games. They sit in third place in the Eastern Conference behind front runners the Toronto Raptors and second-placed Milwaukee Bucks, whose team includes Australians Matthew Dellavedova and Thon Maker. The 76ers also needed to find another superstar to help the team overcome Aron Baynes' Boston Celtics, who sit in fifth place in the East after proving too strong for Rookie of the Year Simmons and All-Star centre Joel Embiid in last year's playoffs. 76ers coach Brett Brown talked before the season about the team shopping for a third superstar and they will get that with Butler. Butler, a shooting guard and small forward, is an elite scorer and defender. The 76ers will send key members Robert Covington and Dario Saric to Minnesota in the deal. Philadelphia's Jerryd Bayless, and a 2020 second-round draft pick will also be sent to Minnesota, while the Timberwolves send back Justin Patton with Butler. The Timberwolves have been a disaster this season with Butler openly vilifying teammates as soft and demanding a trade, and with the team losing all five games on their latest road trip. Head coach and president of basketball operations Tom Thibodeau pulled the trigger on the trade. The deal also puts the 76ers in the box seat to sign Butler next year to a maximum five-year $US190 million ($A263 million) contract - more than any other team can offer.